Home › Aurum Cables Flat Cat6 Snagless Network Ethernet Patch Cable - 12 Feet - Grey..
Aurum Cables Flat Cat6 Snagless Network Ethernet Patch Cable - 12 Feet - Grey..
Gold-plated 50 micron contacts, 550 MHz, and snagless molds resist corrosion, UV proof for direct sunlight exposure, provide maximum durability, and ensure safe / secure connection. Snagless patch cable guarantees smooth and high-speed data transfer for server applications, cloud computing, video surveillance, and online high-definition video streaming. 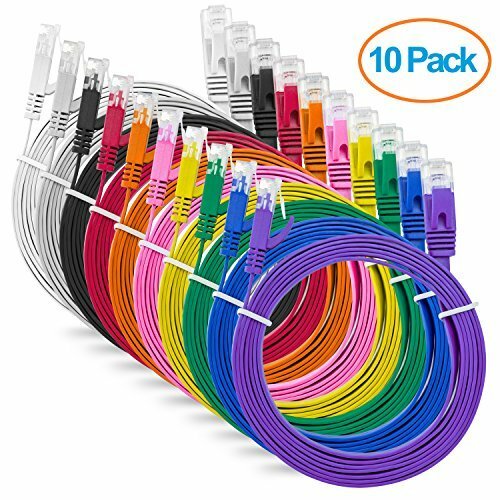 Aurum Cables Flat Cat6 Snagless Network Ethernet Patch Cable - 12 Feet - Grey-Blue-White-Black-Red-Purple-Orange-Yellow-Green-Pink - 10 Pack Proposed for home & office network: Flat Cat6 Snagless Networking Cable offers comprehensive and all around connectivity to home & network components, such as printers, switch boxes, routers, NAS devices, POE devices, etc. Everlasting & highly reliable: Cat6 cable provides remarkable transmission and amazingly low signal losses. Cat6 Ethernet cable supports up to 550 MHz and is best for fast Ethernet, gigabit Ethernet, and 10-Gigabit Ethernet. Cat6 network cable's have gold-plated connectors ensure clean transmission. Specifications: Cable Type: CAT 6 Snagless Network Ethernet Patch Cable Durable PVC Jacket material Equipped with 50 micron gold platting and 24 AWG conductor gauge to enhance cable performance 550 MHz cable performance Stranded Twisted Pair Unshielded (UTP) Power over Ethernet (POE) and Voice over IP (VOIP) compliant Package Contents 10 - Flat Cat6 Patch Cable - 12 Feet includes Grey, Blue, White, Black, Red, Purple, Orange, Yellow, Green, and Pink.